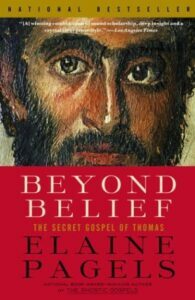 Although the title is a bit deceptive, Beyond Belief is a readable history of how Church “orthodoxy” evolved from Jesus’ earliest followers in the first century through the 4th century when Constantine endorsed Christianity as Rome’s official religion. This book tells the story of how we came to understand Christian faith as the set of beliefs outlined in the Nicene Creed and how selected writings were chosen to become what we now know as the New Testament. While Pagels does discuss the Gospel of Thomas, the book is more about why Thomas was left out of the canon while John was included, so if you’re looking for an introduction to the Gospel of Thomas, this book isn’t it. During the first half of the book, Pagels provides a detailed explanation of how she believes the Gospel of John was written in response to the Gospel of Thomas, which was found among the Nag Hammadi library in 1945. What makes this manuscript especially interesting is that there’s no mention of his birth, baptism, miracles, or death and resurrection. It is simply a collection of 114 of Jesus’ sayings, many of which are similar to the Synoptic Gospels while others are foreign. John says explicitly that he writes so that you may believe, and believing, may have life in [Jesus’] name What John opposed, as we shall see, includes what the Gospel of Thomas teaches – that God’s light shines not only in Jesus but, potentially at least, in everyone. Thomas’s gospel encourages the hearer not so much to believe in Jesus, as John requires, as to seek to know God through one’s own, divinely given capacity, since all are created in the image of God. Another interesting parallel Pagels singles out is John’s reference to Doubting Thomas – a reputation poor Thomas still holds to this day. In the Synoptics, Thomas is simply one of the twelve, yet in John, he is transformed into the doubter in three distinct anecdotes – the raising of Lazarus from the dead, before Jesus’ death when he promises to show them the way to God, and finally after the resurrection when Jesus appears to the disciples without Thomas (differing from Matthew and Luke where Jesus appears to the 11, minus Judas). According to John, Jesus praises those who have not seen, and yet believed without demanding proof, and rebukes Thomas as faithless because he seeks to verify the truth from his own experience. In the second half of the book, Pagels details the chronology of how the books now found in our New Testament came to be included. During the 2nd and 3rd centuries, Christianity was grew popular enough that the Romans took notice and tried to stamp it out. Around the late 2nd century, Irenaeus became distressed at the number of Christians put to death – and those drawn to groups who claimed to receive visions and revelations. Convinced he had the true understanding of Christianity as taught by Jesus’ disciples, he penned several warnings against the deviant practices of these new movements – and in particular, against how Valentinus was interpreting the Gospel of John. God the Father is equivalent to the word, and the word is equivalent to Jesus Christ. Through Irenaeus’ actions, what would eventually become the orthodox canon of the fourth century began to take shape. Finally, Pagels summarizes the events of the 4th century, including Constantine’s conversion to Christianity, the counsel of Nicaea, and later political events. To strengthen his own alliance with church leaders and to unify fractious Christian groups into one harmonious structure, Constantine charged bishops from churches throughout the empire to meet at his expense at Nicaea, an inland city, near a large lake, to work out a standard formulation of Christian faith. From that meeting and its aftermath, during the tumultuous decades that followed, emerged the Nicene Creed that would effectively clarify and elaborate the canon of truth along with what we call the canon – the list of twenty-seven writings which would become the New Testament. Together these would help establish what Irenaeus had envisioned – a worldwide communion of orthodox Christians joined into one catholic and apostolic church. Pagels’ approach is one of personal experience. She begins the book by explaining how her young son was diagnosed with a fatal illness, how she turned to the Church for comfort, and how questioning her own beliefs led her to take a greater look into Christian origins. Throughout many of the chapters, she sprinkles personal anecdotes involving her reactions and reflections as she became more familiar with the history, texts, and heresies. In doing so, she attempts to relate history to modern Christian worship. The one primary argument you could make against Pagels’ thesis is that the date of origin for Thomas is still being debated. Some scholars argue for a later second century date – placing it after the Gospel of John was written and thereby negating much of Pagels’ early arguments in the book that John was written to refute Thomas. Overall, this book is a compelling overview of how “orthodox” Christian beliefs came to be so. Pagels covers a lot of ground in this book and provides lots of endnotes for further study if you choose.